The Food Standards Scotland Education Pack of resources is intended to support teachers deliver the Health and Wellbeing areas of the Curriculum for Excellence. This Teacher’s Guide, which supports the Food Cards and Food Safety scenes, is intended to provide teachers with support in delivering the Health and Wellbeing areas of the Curriculum for Excellence. 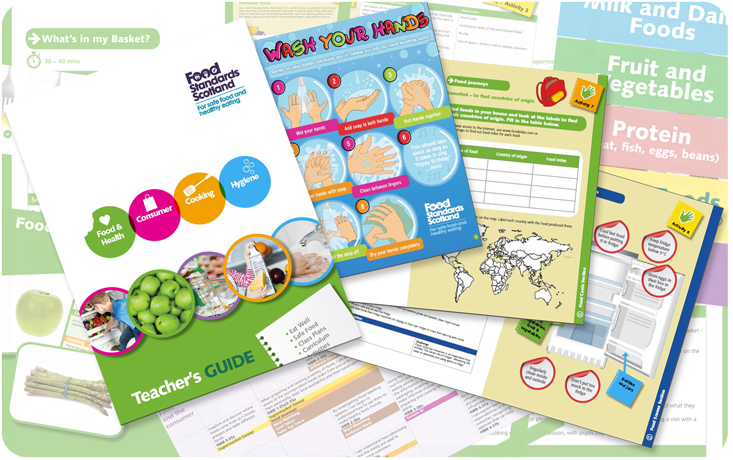 The Teachers guide includes some suggested classroom activities using the Food Cards and Food Safety Scenes along with key messages on diet & nutrition and food safety which teachers can use as a point of reference. You will find some additional information and links at the end of the guide which will direct you to other useful resources and guidance.